Please Note: Tamanu Australia cannot make any therapeutic claims for the use of wildharvested Tamanu Oil. To do so would be in breach of the Therapeutic Goods Administraion laws. Please undertake your own research. My skin felt super soft and not a bit oily when Linda explained to me how the “Beautiful Skin Balm” was produced. 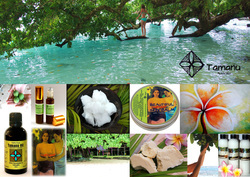 Linda’s Tamanu oil is wild harvested in the South Pacific. The local Ni-Vanuatu collect the nuts on the beaches, fallen from the Tamanu trees, which are growing wild at the Vanuatu beaches. They then dry the nuts in the sun and cold press it afterwards. Simple. I have used the balm ever since. Besides the Tamanu oil, the “Beautiful Skin Balm” also contains virgin coconut oil, organic cocoa butter, avocado oil, local beeswax, vanilla planifolia and East Indian sandalwood oil. All sourced directly from the South Pacific with great healing power. I remembered Linda’s advice to also use my balm on all sorts of skin irritations, when my boyfriend burned his skin and got a terrible burn blister. The effect was so surprising, I wish I had taken a before and after picture about it. It just makes me happy to know that small, sustainable and ethical businesses do exist and that there is so much out there growing in the sun that could actually help us way more than any other chemical medicine or skin care. In Bellingen I have discovered that sometimes the simplest, small things are the best. 'Firstly I would like to thank you for your wonderful customer service and after care. I stumbled across your product doing a google search for my ongoing acne. I must admit I was sceptical. I have spent so much money in the last 20 years treating my acne. I was getting desperate & had an appointment to see a dermatologist to talk Roaccutane. I have tried absolutely everything over the years and Roaccutane was my last resort. I thought let's just try Tamanu oil before my next appointment to the dermatologist. So I ordered through Linda and I couldn't be happier. I noticed my skin clearing up within the first 2 days. It has now been nearly 2 weeks and I only have a few very tiny spots that only I can see. No cystic hard lumps since I have been using the oil. ‘I started using Tamanu Oil three months ago, at first on my scars and saw that they were fading, I applied it three times a day and within 1 month they had faded in colour and were much smaller in size, after another 2 months they had decreased to almost nothing. After seeing such great results on my scars I started using it on my acne and literally after just a few days, the redness and spots had diminished to almost nothing. I have been using it on my face for about 2 weeks and it has cleared my skin of nearly all pimples and black heads making my skin clearer and giving me more confidence. ‘I first struck Tamanu oil when I had a lesion on my hand and I received some by Linda of Tamanu Australia to put on it. After a week or so of rubbing this earthy smelling oil on the back of one hand, my hands looked completely different. Aside from being completely healed, the hand I was using it on looked about 10yrs younger than the other!! Of course I instantly asked Linda ofTamanu Australia if I could use it on my skin as a moisturiser and was assured I could as long as I avoided my eyes. I have been using the pure Tamanu Oilfor about 12 mths on my face and hands..... my skin has never looked better! By using Tamanu Oil on my face, the Tamanu seems to be bringing all my dry spots and sun damage to the surface, drying them out further to eventually disappear! ‘I have been using Tamanu Oil as a moisturiser for a little over 2 years, all over my face. First of all I was mostly concerned about the lines and wrinkles under my eyes. Since I was 22, I have been using various products that all give their promises to eliminating wrinkles. I am now 45, but nothing has ever worked. i never got the results I was looking for, until now. This Tamanu Oil has softened the lines and wrinkles under my eyes to the point that I can actually see a huge difference. It has even softened my crows feet. I love Tamanu Oil. After being introduced to Tamanu Oil by a friend, I was hooked.I have very dry skin and hair and use it on both, doesn't leave an oily residue. Also had some bad scaring on my hand and is helping with the appearance of the scars, wonderful oil. I Am introducing other friends and they also loving Tamanu. cheers Kerrie Hammond Qld. ‘I met Linda from Tamanu Australia, about 6weeks ago and have been using Tamanu every day since then. I just can't say enough good things about it. I began using it under my eyes in an effort to clear some dryness that had been there for about a year. Within a week there was no sign of it but not only that, my skin looked so much better and now many of the lines and wrinkles have also vanished. I will be using this every day for the rest of my life! I love that it's all natural and that us buying this will also make positive contributions to small village in Vanuatu. 'I have recently come across Tamanu Oil and I am very happy I decided to give it a go. I love using it at night on my face as it helps blemishes to heal a lot faster, like nothing else I have ever tried. I love it on my body too, as a pole dancer I have rougher skin on the inside of my legs and Tamanu Oil seems the only product that helps soften it and make it smoother. 'Since using Tamanu Oil my husbands hands are now soft and supple and nice to hold. I just love using it on any dry areas as I receive an instant result in beautiful soft skin, would highly recommend Tamanu Oil’. ‘All the two of us can talk about since Sunday afternoon is you and your wonderful product. On Sunday afternoon I got a little (lot) sunburned by the pool and I put the tiniest bit of Tamanu oil on my sunburn and it relieved it immediately and by the morning my skin was dark brown. I've tried it on my sensitive bikini line and I didn't get the awful shaving rash I normally get. This Oil is brilliant!!! I have just bought another bottle…my son is using it to clear up his acne..
My son is a wonderful & thriving sixteen year old. As a result of a brain stem tumour which, miraculously, was defeated some years ago, he now has a significant number of issues & disabilities, one of which is Bell's Palsy. As a result of this he tends to dribble into his pillow at night and gets the usual teenage acne. which he is concerned about. My son gently washed and exfoliated his face with anti-bacterial soap every day. This all seemed to help to some extent but complete eradication was out of the question. Obviously, throughout these months of treatment, we also carefully monitored my son's diet. I recently learnt about Tamanu Oil but, admittedly, was very dubious about its effectiveness. I bought a 50ml bottle and decided to give it a try because, after all, nothing else was working. For most days during the first week of its use, he applied the oil twice a day, However, the huge improvement to my son's skin was just incredible and only the most stubborn areas of infection remained. The results were so remarkable - even at this early stage - that I actually told my GP about the Tamanu Oil in case she felt that it could help other patients of hers. Now my son's face, in third week of using this oil, is nearly totally clear of blemishes. It has also proven extremely cost effective. The oil spreads so thinly that I'm only ordering our second bottle now. I will continue to use it to treat my son's skin when clear for at least a further two weeks just to make sure that all the acne has been completely eradicated. I will also now ensure that a bottle of this Tamanu Oil is an essential component in our house. I bought my first bottle of Tamanu Oil in Bellingen and it was brilliant! I told my brother about the Tamanu Oil, he is to say in the least rapt! I foolishly ordered some off ebay which must have been farmed or not pure and it wasn’t a patch on your product, you did tell me when I first talked with you, next time I will heed your warning. "Hi, My husband has had psoriasis for over 30 years. It started around his elbow and knee joints and it has spread to cover his legs and buttocks and is even on his scalp. His skin is constantly itchy and he scratches until his skin bleeds. The psoriasis is very dry and is flaking off all the time. We have been to innumerable skin specialists and have tried all manner of prescription medications, ointments and treatments. Most of these treatments are costly and the medication is toxic. His psoriasis gets worse when he’s stressed. When I spotted your stall at the market it was the worst I’d ever seen it. I purchased some oil from you at the Coffs Harbour markets several weeks ago and bought it home for Steve to try. Steve is quite used to me buying all sorts of ‘natural’ products with little to no result. Anyway, he humoured me and started using it only on his legs and within a day the itchiness stopped and within a week or so his skin didn’t have the large dry patches and the flaking had stopped. His psoriasis is now pink and soft and the smaller spots are almost unnoticeable. He has since started putting it on all his psoriasis patches and his skin looks better and he isn’t scratching anywhere near as much. Even he admits he is scratching now out of habit and not because anything’s itchy. We are looking forward to seeing what happens with continued use, as it’s only been a couple of weeks since he started. Yes I do love Tamanu, it has been excellent for my very dry skin (no more flaking dry spots and I only get the occasional pimple now whereas before they were quite a problem). I have also persuaded my work mate Lisa Adams to try Tamanu Oil as she suffers terribly from acne and has lots of acne scars. At the moment she has a terrible breakout on her chest, shoulders and back. The Tamanu Oil had improved it after 2 days so I will be really interested to see how much it helps after she uses it for a longer period. "I purchased my first bottle of Tamanu oil from you a couple of weeks ago and I have to tell you, that after trying several traditional remedies for eczema, I am pleased to tell you that after just ONE application of Tamanu oil, most of the redness was gone and ALL of the terrible itch associated with it was gone as well. I am almost completely healed now. Very impressed. I will use this product forever." I just spilled freshly boiled water over the back of my left hand while filling my water bottle....stuck it under a cold tap for a minute then put tamanu on it...I will let you know in the morning....Love this stuff! The Tamanu took that lovely sting you get from burns out instantly and I have woken after 2 applications with no sign of any burn!!! !Astounding....it isnt red, blistered or even tender! Cant thank you enough for bringing Tamanu into my life! ‘Hi Linda, Peter & I met you at Bellingen Market and purchased some Tamanu Oil mainly for Peter's use to try as a natural suntan protector. Tamanu Oil has fulfilled it's promise as a very good suntan protector and Peter is out in the sun in his work. He has ceased using any commercial suntan lotion which he wasn't happy about using anyway & now just uses the Tamanu Oil’. My name is Gary I am 73 years of age, and for the last 15 years suffered from arthritis in my knees, on trying everything in the chemist shop for arthritis, nothing gave me relief, I was told by a friend to try Tamanu Oil from Tamanu Australia. I have always looked for chemical free products and was using only coconut oil on my skin, having given up finding a product without preservatives and nasties. The down side of coconut oil was that I was left unprotected from the sun. After being introduced to Tamanu Oil by a friend, I was hooked.I have very dry skin and hair and use it on both, doesn't leave an oily residue. Also had some bad scaring on my hand and is helping with the appearance of the scars, wonderful oil. I am introducing other friends and they also loving Tamanu. ‘I met Linda from Tamanu Australia, about 6weeks ago and have been using Tamanu every day since then. I just can't say enough good things about it. I began using it under my eyes in an effort to clear up a rash that had been there for about a year. Within a week there was no sign of it but not only that, my skin looked so much better and now many of the lines and wrinkles have also vanished. I also suffer from arthritus and have been rubbing the Tamanu into my joints. It certainly doesn't completely remove all pain but it does substanially improve joint mobility. I have even got my kids onto Tamanu. My son now uses it every day.....thinks it is magic! And he may well be right. There is nothing on the market that can clear up a rash, itchiness, pimples, inflammation or scar tissue like Tamamu. 'I have recently come across Tamanu Oil and I am very happy I decided to give it a go. I love using it at night on my face as it helps blemishes and scars to heal a lot faster, like nothing else I have ever tried. I love it on my body too, as a pole dancer I have rougher skin on the inside of my legs and Tamanu Oil seems the only product that helps soften it and make it smoother. 'Since using Tamanu Oil my husbands dermatitis has improved, his hands are now soft and supple and nice to hold. My son received an injury over the new year period and we used the oil on the scar tissue, with great results. I just love using it on any dry areas as I receive an instant result in beautiful soft skin, would highly recommend Tamanu Oil’. Dad put it on his poor sore feet and he loved it. Not only did it help his poor circulation and warmed his feet up but it also helped with his blisters. I also tried it on my swelling hand with which the skin cracks and bleeds from the neuropathic pain and it worked so much better than the steroidal ointment which I usually use. My son is a wonderful & thriving sixteen year old. As a result of a brain stem tumour which, miraculously, was defeated some years ago, he now has a significant number of issues & disabilities, one of which is Bell's Palsy. As a result of this he tends to dribble into his pillow at night and so is prone to ringworm and other fungal infections as well as the usual teenage acne. I treated my son's face with a number of topical anti-fungal creams available at the local chemist. He also gently washed and exfoliated his face with anti-bacterial soap every day. This all seemed to help to some extent but complete eradication was out of the question. After a visit to our GP we began applying a prescription lotion to the problem but still the same limited results. Obviously, throughout these months of treatment, we also carefully monitored my son's diet. I recently learnt about Tamanu Oil but, admittedly, was very dubious about its effectiveness. I bought a 50ml bottle and decided to give it a try because, after all, nothing else was working. For most days during the first week of its use, we were only able to apply the oil twice a day, instead of the suggested 3-4 times. However, the huge improvement to my son's skin was just incredible and only the most stubborn areas of infection remained. The results were so remarkable - even at this early stage - that I actually told my GP about the Tamanu Oil in case she felt that it could help other patients of hers. Now my son's face, in third week of using this oil, is nearly totally clear of blemishes. It has also proven extremely cost effective. The oil spreads so thinly that I'm only ordering our second bottle now. I will continue to use it to treat my son's skin when clear for at least a further two weeks just to make sure that all infection has been completely eradicated. I will also now ensure that a bottle of this Tamanu Oil is an essential component of our family medicine kit. I have always been one to react badly to mosquito bites, they inflame and become infected very quickly. I have tried many herbal and pharmaceutical preparations but to no avail. I bought some Tamanu Oil from Tamanu Australia, after a friend suggested I try it. It works for so many skin conditions but I am particularly happy that I have found a natural remedy that gives me instant relief from my itchy, red mossy bites!! I received my order today. I appreciated the care with which it was wrapped - thank you for the little something extra. Love the oil. It is helping to remove some old and deep-seated keratoses. And it feels so good! My skin actually feels nurtured. I bought my first bottle of Tamanu Oil in Bellingen and it was brilliant! I told my brother about the Tamanu Oil, he has psoriasis, he is to say in the least rapt! Linda this oil is AMAZING! Thx so much for all the info you have posted. It took 3 days to fix my sore blistered lips. My Dr had prescribed a Zinc based cream which he advised would take between a week to two weeks. I would like to buy 2 more bottles as a friend has a touch of eczema and her friend has psoriasis. I am keen to recommend this to all. Just wanted to say thanks for the amazing Tamanu Oil. Incredible stuff.....My daughter has had a wart on her ankle for about a year now. We put a drop of Tamanu Oil on the wart and covered it with a bandaid. We did that every night for 5 or 6 nights in a row. The wart just shrunk and shrunk and has now totally disappeared!! So easy and totally painless. Brilliant stuff!! I have also used it on sunburn, and on a steam burn on my hand. It really helped with taking the sting out of both types of burns. Thanks for letting us know about Tamanu Oil. BTW I “discovered” you/your products at the Bello markets earlier this year. I live up near Glen Innes and it certainly helped my skin get through the winter better than previous years. I purchased some Tamanu Oil 6weeks ago and have been using Tamanu every day since then. I just can't say enough good things about it. I began using it under my eyes in an effort to clear up a rash that had been there for about a year. Within a week there was no sign of it but not only that, my skin looked so much better and now many of the lines and wrinkles have also vanished. I love that it's all natural and that us buying this will also make a positive contribution to a small village in Vanuatu. This is an amazing product that everyone can benefit from! Thanks Linda. I am so in love with your gorgeous tamanu oil. I just love the way it leaves my skin feeling so soft and revitalised and much clearer. I have just purchased some to give my husbands elderly aunt who suffers from itchy skin as I believe it will help her. Would you kindly include one of your brochures with my order so she can read all about it. Thanks very much. To offer organic & wild harvested produce from local growers in Vanuatu for the benefit of good health, happiness and ethical & sustainable trade.